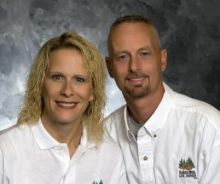 Greg & Vickie HancockA locally owned and operated business in Lock Haven, Pennsylvania, Hancock Home Inspections (HHI), was founded in 1995 by husband and wife, Greg and Vickie Hancock. In it's twenty-two years of existence, HHI has performed over 10,000 home inspections throughout Pennsylvania. Read about our 10,000th customer! When deciding to start the home inspection business in 1995, Greg, rather than purchase a franchise from a national inspection company, chose to build the business solely on the Hancock name and reputation. Since that time, Hancock Home Inspections has become well known and respected in the home inspection and real estate industries. The business was built with one philosophy in mind: Offer the home inspection client personalized services, second to none and far beyond their expectations. Greg performs each inspection as though he were performing it for a family member. HHI is a certified member of the National Association of Certified Home Inspectors. HHI understood early on and even before it became a state requirement, to be a credible inspection company by aligning itself with inspection industry leaders and associations. When you choose Hancock Home Inspections to perform your inspection needs, rest assured you are utilizing a very experienced company with a commitment to excellence. HHI is in full compliance with the Pennsylvania Home Inspection law. Greg Hancock has received his Certified Master Inspector designation. The prestigious C.M.I. designation is given only to those inspectors meeting the high compliance qualifications of the C.M.I. board. The designation also requires it's members to adhere to the industries most strict Code of Ethics and Standards of Practice. The 1982 graduate of Eastern Maine Technical College states "being a home inspector has been a great experience and no two days are the same. I wouldn't want to do any other job." Hancock Home Inspections is a fully accredited member of the International Association of Certified Home Inspectors. With Greg being a 13 year Army Veteran and Vickie's strong military family history, Greg and Vickie are proud sponsors of the Wounded Warrior Project. We thank all Veterans, Young and Old, for their Service. Be sure to ask about our Military Discount.